May 31, 1927. Had an interview with a Mr. Bockstice who has a beautiful garden across from school. He gave me an armload of peonies. Poem #30 of 30 Poems in November. I did it! And, it's not too late--you can still celebrate this achievement by making a contribution to Center for New Americans. Thank you, friends, for cheering me on and supporting my efforts. Whew! You did it, and did it SO well, kiddo. I, too, love peonies, as did my grandma........I so love this poem. Peonies still haunt me tho grandmother's place is sold. Congratulations, Marian! I've enjoyed reading as you were writing, just sorry I did nor get to comment on every one, as this dreaded November is such a hectic time for me. I love the simplicity of these lines, the careful placement of words like youthful and simply, and the wealth of human love and memory and letting go of the past that you have summed up in 6 lines. Sterling work! I enjoyed this poem, but I do wonder why you wanted to let the peonies go...I love peonies too. hi Mary, thank you. it's a longer story told in these pages, to some degree. i'm working on a collection of poems and stories written by my grandmother and inspired by her. this is just a teensy part of that bigger work. oh... I love this, I do. Beautiful, Marian, and quite the accomplishment, too. I missed so many because I was away. 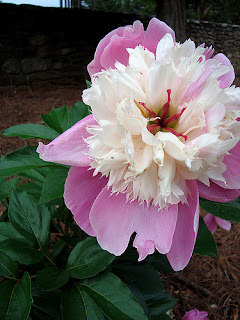 I have a peony plant that seldom blooms but, when it does, it is wonderful. We should all have the confidence and faith to let go the grip on youth. Nice write, Marian. Bravo for your November achievement. someone challenged me to keep it going to the end of the year. we'll see what happens! Marian, it's taken me too long to get here! This is a lovely, pure poem. I love to write about my grandmother, too. Writing those stories, in poetry, in prose, however, is just as important as writing your own. Thanks to the Web, we are all able to share them and OH! The magic that buzzes in cyberspace. Peace, Amy (here's one about Grandma Blanche, who has her own category in my "tag cloud!" thank you! you can read more of my grandmother's writing and my writing about her here, too. just click on "my grandmother" in the tag cloud. i'll come over and read yours, Amy.